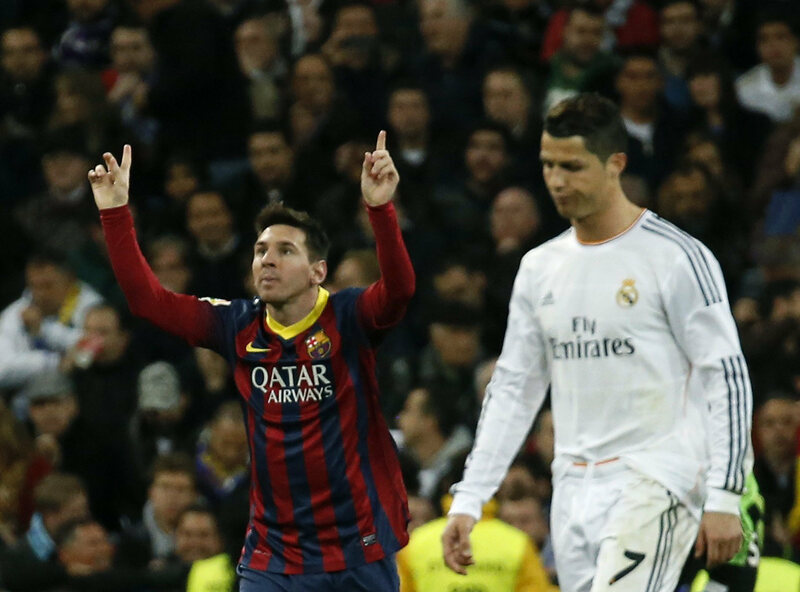 Real Madrid 3-4 Barcelona: Messi's hat-trick sinks Madrid! You Are Here: Home » Neymar news: 2018-19 » Real Madrid 3-4 Barcelona: Messi’s hat-trick sinks Madrid! 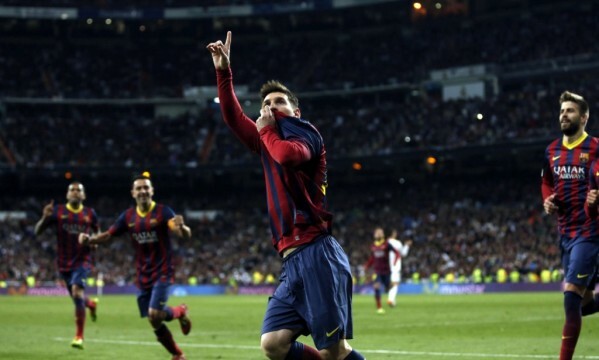 Real Madrid 3-4 Barcelona: Messi’s hat-trick sinks Madrid! Barcelona line-up: Valdés, Jordi Alba, Mascherano, Piqué, Daniel Alves, Busquets, Xavi, Iniesta, Neymar, Lionel Messi, Cesc Fabregas. The Spanish League is once again a 3-horse race, after Barcelona‘s 3-4 win against Real Madrid, last night at the Santiago Bernabéu. The hero of the night was Lionel Messi, who scored another memorable career hat-trick and led the Blaugrana to their most important win so far in this season. 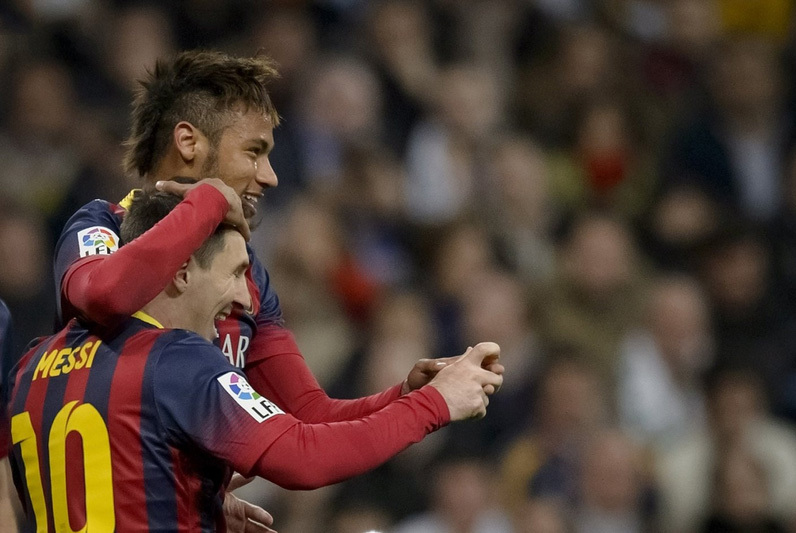 The visitors were actually the ones to take the first lead, after a superb shot from Andrés Iniesta. 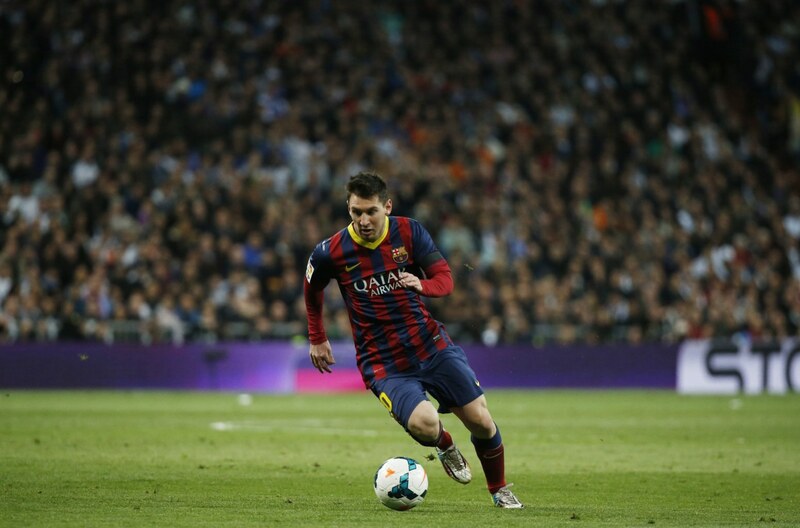 The Barça midfielder picked up a good assist from Messi and struck it hard past Diego López to make the 0-1. Real Madrid‘s response came shortly after, on a terrific header from Benzema following a cross sent into the box by Angel Di María. The same two men would repeat the play 4 minutes later, this time with Benzema finishing it off with his right foot. 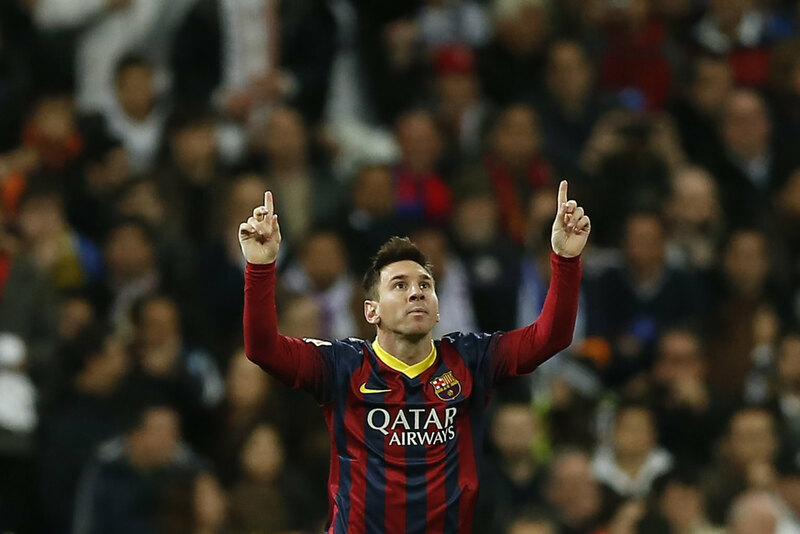 The pace of the game was frantic and the Merengues had just turned around the scoreline in less than 5 minutes. As we were getting closer to the half-time, Barcelona turned another shift in a final attempt to still reach the equalizer before the break. 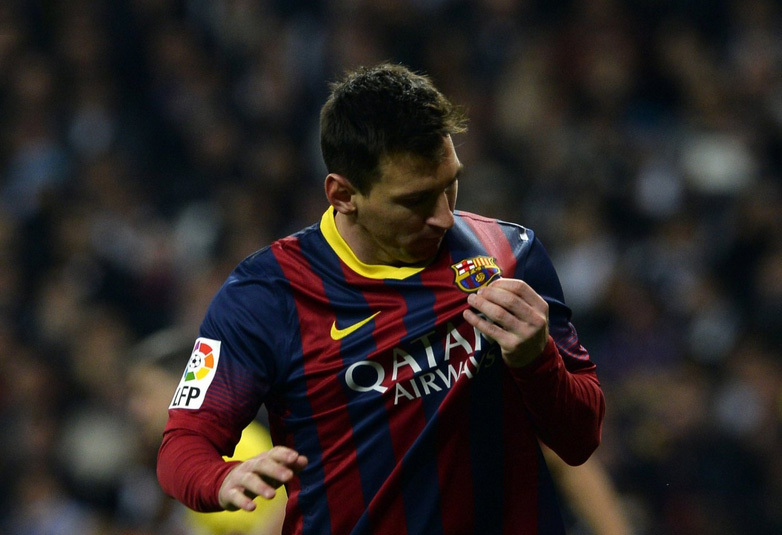 The effort paid off in the 42nd minute, when Lionel Messi captured a ball already inside Real Madrid‘s box and after a few touches he struck it low past everyone, including Diego López. 2-2 at the Bernabéu and we were finally going into half-time on a “Clasico” that was certainly not defrauding anyone’s expectations. Roughly 10 minutes after we had resumed for the second period, Real Madrid earned a penalty-kick after Cristiano Ronaldo got tripped by Daniel Alves a few inches before stepping into Barcelona‘s box. The referee pointed to the spot though and the Real Madrid forward didn’t blink twice when he slammed it past Victor Valdés. Barça couldn’t afford to lose this game and having in mind the 4-point difference in La Liga standings ahead of this Clasico, even a draw would have to be seen as a negative result. Gerardo Martino resisted to the temptation of changing players after the Merengues reached the lead and aroun the 62nd minute, it would be Neymar drawing the foul and the penalty-kick inside Real Madrid‘s box. The Brazil international escaped Real Madrid‘s defenders after a great through pass from Lionel Messi and when he was preparing to attempt to beat Diego López, Sergio Ramos clipped him on his right ankle from behind. Undiano Mallenco (the referee appointed for this Clasico) sent off Ramos with a straigh red card just a few seconds after he pointed to the spot. 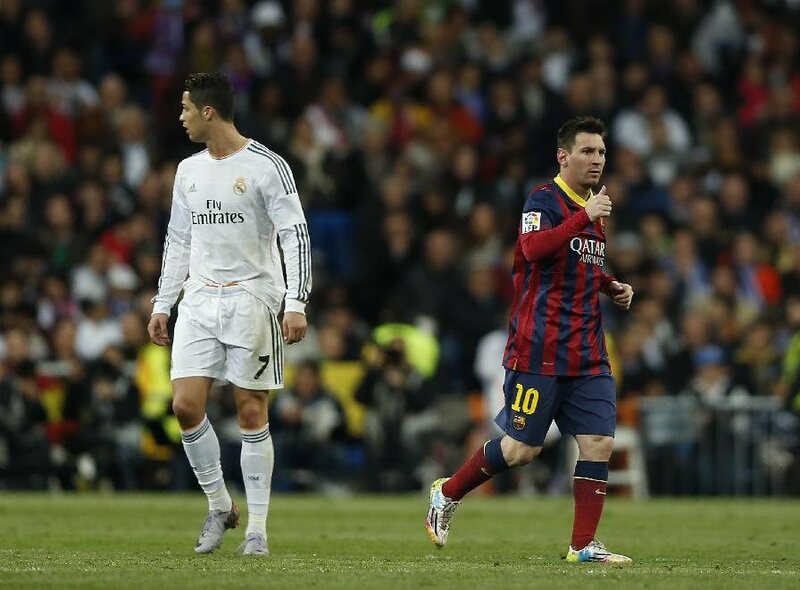 As usual, Messi claimed the responsibility and had no problems converting it to make it 3-3 on the scoreboard. The final blow was delivered in the 84th minute, and once again from the penalty-kick spot. Andrés Iniesta managed to get past between Carvajal and Xabi Alonso inside Real Madrid‘s box, and the former Liverpool midfielder seems to have used his thigh to clip his opponent as he was passing by him, leading him to go down to the ground. Penalty given and just as he had done a few minutes before, Messi gave no chances to Diego López and set the final score in 3-4 to Barcelona. It’s the second hat-trick in a row from Messi, who has now also become the top goal scorer ever in Clasicos, with 21 goals.